He feels like screaming, but if only someone is listening. The world is hearing, to something, for they all have their ears plugged-in. But definitely not him , not him. He pings, he sings , he starts begging. Yet no-one bothers to ring him. No-one bothers to see, if he is still existing. The slight touch of the mid-night, he feels every time. Like for him the Sun went down, and so did light. Like the earth has turned cold and the world is broke.He has a friend , only one who loves always. To drain his pains.To the point of making them non-existent. 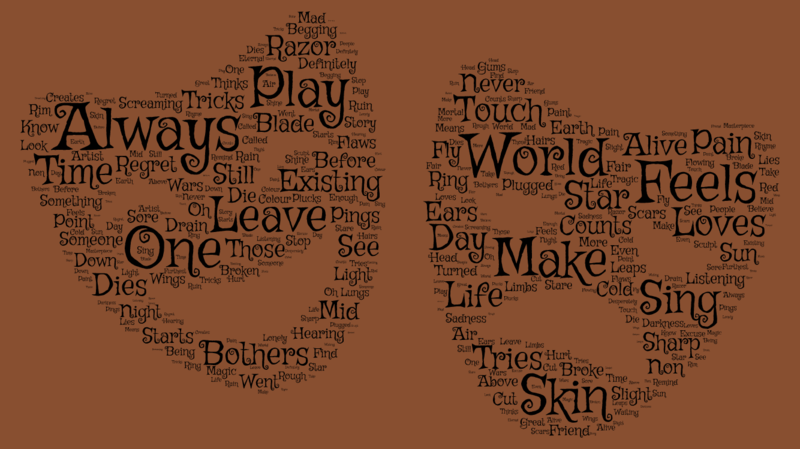 He plays with razors to leave his scars. He counts his flaws like he counts the stars. And the world thinks they know about his wars. Every day he leaps into darkness.Tries to fly above the sadness.In his broken wings, and his sore limbs.It all feels like magic. Like his life-story, being tragic. For he’s always alive, even after his tricks to die. He plays with those blades to cut his gums. Tries to stop the air from, flowing in his lungs. Oh, no he’s not mad enough he just loves to play it rough. He plucks his hairs. To make his head look more fair. To make people, in him, at least stare. He’s a great artist. He creates masterpiece. With all his sharp tricks. He’s only regret is he never touches his skin. Always leaves them alive to ruin.He’s only regret is he never find means to hurt his skin. No he should, and he would. Paint them red colour with his own sharp blade of that razor. He should sculpt his pain on his skin.For the days of rain, would always, remind him ,that he was lonely, like a star in the furthest rim. Desperately waiting, for his time, to take his mortal shine, to leave this excuse they called “Life” and sing in eternal rhyme, to believe in all those lies. Before he dies, before he dies.